On new year’s eve, my friends and I started our big night of festivities in Manhattan and then hopped on the L train to go over to Brooklyn shortly before midnight. 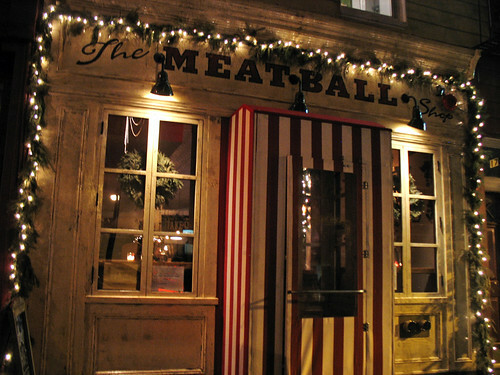 Then we decided we wanted one last snack in 2011 before the new year – and ended up at what I consider one of the finest choices in bar-hopping food: The Meatball Shop. Because this raises, once again, the question of “Is a meatball slider a burger or not?” which I asked just before the holidays in my review of Mighty Balls at the Union Square Holiday Market. And I’m still saying “yes”, meatball sliders count as a burger. Mostly because they are just so delicious that I want extra reasons to justify eating them whenever I encounter them. 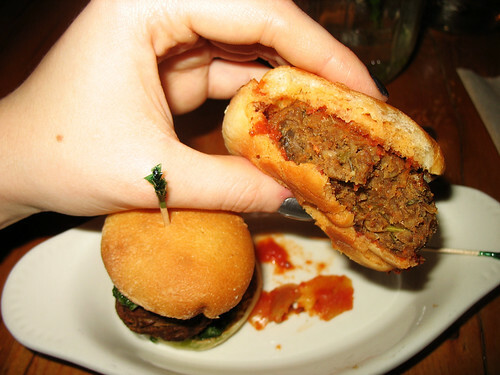 And The Meatball Shop’s sliders are delicious. I’ve eaten them a few times previously, but I was without a camera at the time and didn’t want to do a full review without decent photos to really do these yummy morsels justice. 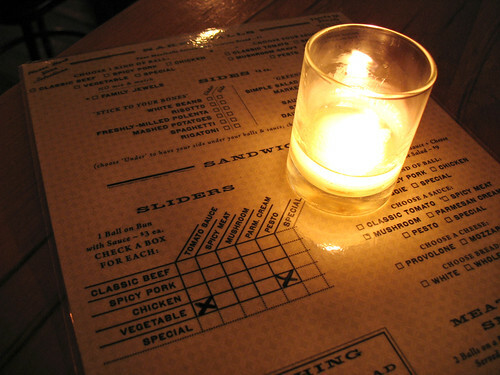 I’m also a big fan of the menu system at the Meatball Shop – you mark your order on a laminated menu with a dry-erase pen, checking off the type of meatballs, sauce, etc. that you want. This greatly appeals to the OCD list-maker in me as well as the “please oh please make sure you don’t get my order wrong and give me something that I won’t realize is actual meat until I bite into it by mistake!” fear that I still get when eating in restaurants. I ordered two sliders because I had actually eaten a first dinner earlier in the evening, so I was just hungry enough to sample two for variety for this review, but not hungry enough for three which would probably be a better number for a full meal. Mmmm… what a great taste to end the year with! 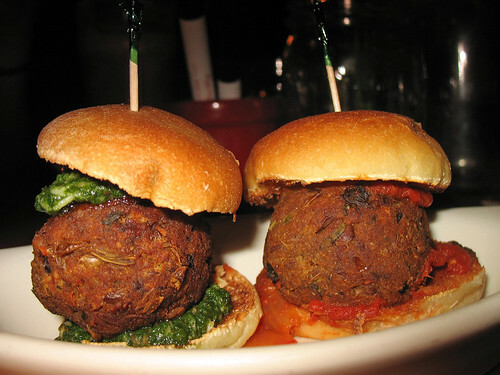 I had one slider with traditional tomato sauce and another with pesto. Because I frakking love pesto. The tomato sauce is delicious too, don’t get me wrong, but really nothing holds a candle to pesto in my book! And the veggie meatballs themselves were amazing as well. These ones really hold their “ball” shape and don’t flatten out like burgers (but they still count, right? ), they’re perfectly crispy on the outside and dense and chewy on the inside. A nicely-spiced and herbed mix of beans and veggies, which particular beans and veggies I honestly could not tell you though – although I was told the balls are not vegan, because they contain eggs and cheese. There’s actually a recipe for them online here, if anyone is interested: http://well.blogs.nytimes.com/2011/11/14/the-meatball-shop-goes-vegetarian/ Also, highly important when dealing with meatballs/burgers of slider size: the buns were light and puffy and perfectly-sized for their contents! 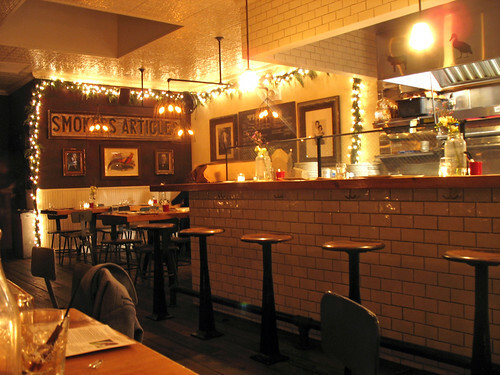 And look how warm and cozy this place is! Cost: $3 per slider, you’d probably want to order 3 for a full meal. That “please oh please make sure you don’t get my order wrong and give me something that I won’t realize is actual meat until I bite into it by mistake!” experience hasn't really crossed my mind in the month or so since I stopped eating meat, but that didn't stop it from happening to me. I went out to dinner with Kristin and some acquaintances of hers while she was in DC recently. I ordered a vegan curry and the girl sitting next to me ordered lamb curry. I'm sure you can guess what happened next. I wasn't too upset about it because I'm only just on the wagon, but they're lucky I'm not persnicketier. On an unrelated note: are we going to eat veggie burgers when I'm in New York next month? They're really delicious, just had one yesterday...mot so easy on your stomach though!